At the dawn of the 20th century, violin making in Italy was flourishing on a scale that had not been seen for almost two centuries. One of the greatest beneficiaries of this was Giuseppe Leandro Bisiach, today known as Leandro Sr. Despite his modest background, he had the talent and acumen to found a dynasty of five maker–dealers and to build a grand violin making and dealing establishment. This was the first of its kind in Italy, and one that would bring him fame and fortune, firmly carving his family name into violin making history. The man who was destined to create the ‘post-Antoniazzi’ Milanese school was born on 15 June 1864 in Casale Monferrato, Piedmont. He shared his birthplace with Count Cozio di Salabue, the first great connoisseur and collector of fine violins. Two important contemporaries, Annibale Fagnola and Celeste Farotti, were born in the immediate vicinity and quite a number of other excellent makers, including Giovanni Battista Pressenda and Giuseppe Rocca, also originated nearby. I have often wondered why this particular region, lying to the east and south-east of Turin, should have been the cradle for so many excellent violin makers, despite the fact that they mainly perfected their craft in Turin or Milan completely independently of each other. It is said that around 1886 the 18-year-old Leandro was encouraged by his father, a music-loving ‘wood-turner’ or carpenter, to try his hand at making a violin, and the resulting instrument met with local approval. Soon after that he moved to Milan, where he learnt the basics of violin making from the last of the traditional Cremonese violin makers, Gaetano Antoniazzi and his son Riccardo, who had both worked in Milan since 1870. Bisiach developed a long-term and fruitful relationship with the Antoniazzis, employing them to make many of his instruments, and together they developed what we would now term the ‘modern Milanese’ style, although Bisiach later veered off in a direction of his own, which was perpetuated through the 20th century through his fine pupils and collaborators. In parallel, the Antoniazzi school, apart from Bisiach’s direct involvement with them, also thrived independently through such excellent makers as Erminio Farina, Giuseppe Peddrazzini, Pierro Parravicini, Luigi Galimberti, Azzo Rovescalli, Carlo Severo Riva, Carlo Ravizza, Ambrogio Sironi and Camillo Mandelli – all of whom it appears managed to survive in Milan without working for the Bisiachs. While Gaetano Antoniazzi’s making remained firmly planted in the ‘late Cremonese’ style, Riccardo and his younger brother, Romeo, eventually developed a more modern approach, especially with regard to modeling and varnishing. The brothers Antoniazzi in their personal work tended to borrow their patterns from earlier Cremonese models, mostly basing them on Giovanni Battista Ceruti and the grand Amatise pattern. However, both they and Bisiach pursued stricter construction rules, yielding cleaner workmanship than that of their immediate Cremonese predecessors, and the freer and faster ways of making we associate with most of late Cremona gave way to the revival of the more regimented methods common to the classical Italian makers. The fine violin making of early 20th-century Italy now generated only very pretty instruments made of finer imported wood, covered with lush orange-red varnish and displaying highly controlled purfling, perfectly executed edgework and symmetrical corners. In the eyes of many, including his new clientele, Bisiach’s relationship with the Antoniazzis accorded him the all-important link with the Cremonese school. His enthusiasm, proficiency in playing the violin and considerable social skills gave him the necessary advantages to create a strong following. By 1889 he had opened a workshop in the prestigious Piazza del Duomo, where he began to make, repair and, importantly, deal in old instruments. Dealing was both educational and lucrative and Bisiach soon came to dominate and control the trade in old Italian instruments, both locally and with foreign firms. He married Maria Vismara in the same year and his first son, Andrea, was born a year later. Leandro went on to have seven children and all the four boys took up violin making as a profession. I have come across only a handful of Bisiach instruments that date from the late 1880s to the early 1890s. During this period they are rather experimental in nature, as the young maker looked for ways to modernize and personalize the Antoniazzi style. They tend to lack the refinement and conceptual strength associated with the instruments bearing his original labels from the 1895–1900 period, which show a superior hand – one which I associate with Gaetano Antoniazzi and, after Gaetano’s demise in 1897, with Riccardo. Some instruments, dating from around 1895–1908 in particular, are true masterpieces. Their artistic value is greater than Bisiach’s future production, and they were made by entirely different sets of hands – primarily the Antoniazzis, Giuseppe Ornati and Gaetano Sgarabotto. Unlike some of the instruments made by the Antoniazzis in their own names, they are never large or overly arched and are inspired by Stradivari and Guarneri ‘del Gesù’ rather than Amati and G.B. Ceruti. The varnish in the period around 1890–1896 is very ‘late Cremonese’ – tending to a harder and thinner consistency and a yellow to orange-brown color – but towards 1900 they become quite thick and pasty, and generally more red-brown. These turn-of-the-century instruments are largely the works of Riccardo and perhaps Romeo Antoniazzi; they differ significantly from the c.1890–c.1896 instruments crafted primarily by Gaetano. During these early years Bisiach participated in several international exhibitions: London and Atlanta in 1895, Turin 1898 and the prestigious Universal Exhibition Paris in 1900, where he won high praise and several prizes. In developing his business Bisiach clearly adopted the approach of J.B. Vuillaume. Like that first true master of highest quality mass production, Leandro made a great effort to learn about classical Cremonese instruments by dealing in them extensively. 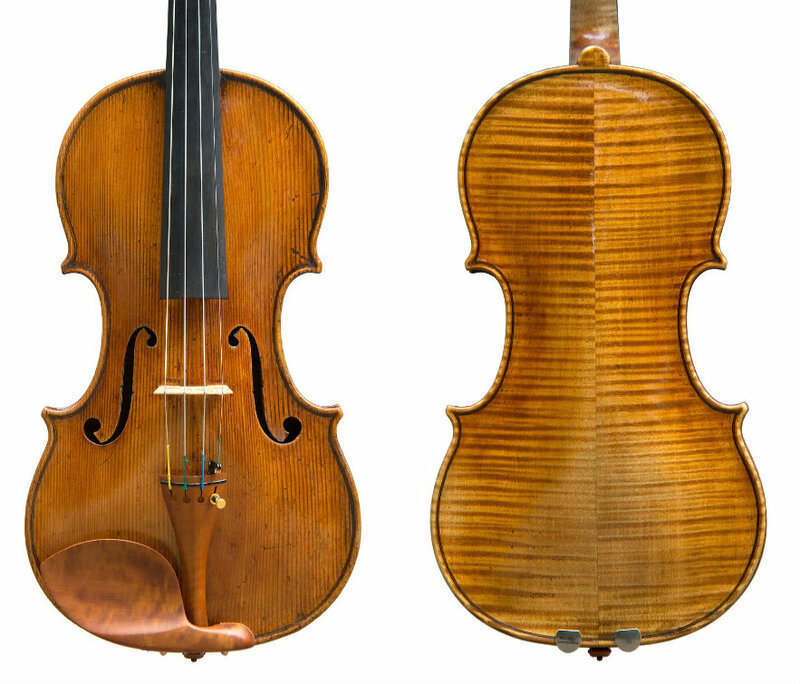 However, unlike Vuillaume, who was obsessed with making exact copies of Stradivari and Guarneri ‘del Gesù’ instruments, Bisiach remained quite faithful to his immediate roots, the traditions of the Antoniazzi family, even when conceiving models based only loosely on those of the classical Cremonese makers. From 1900 on he mainly used models based on Stradivari, Guarneri and, a little later, Amati. Some instruments are broadly copies of other makers, such as Rugeri, Andrea Guarneri and G.B. Guadagnini, without being exact imitations. Bisiach realized from the outset that both musicians and collectors preferred the appearance of old varnish on newly made instruments and began experimenting with shading and staining his varnishes to imitate the natural wear process on classical specimens. 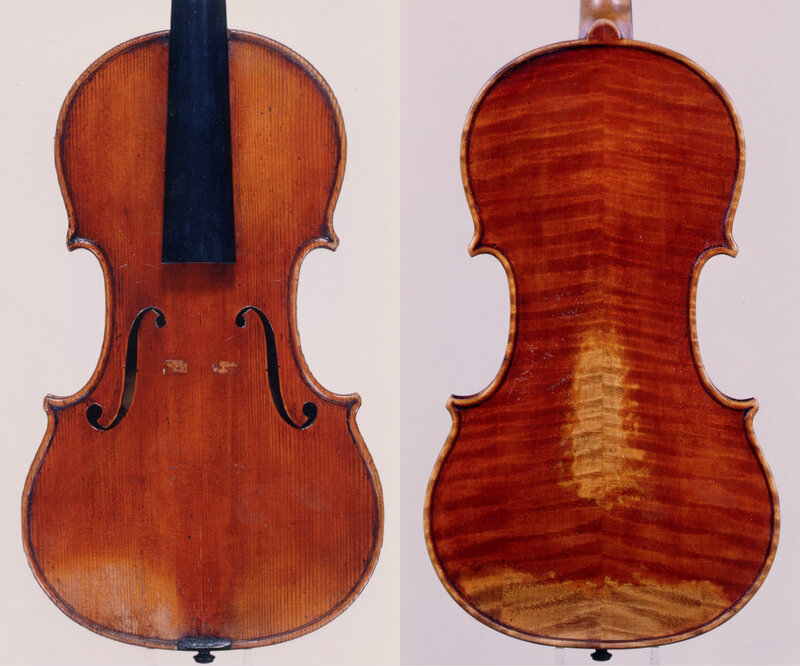 He may have gone too far for some tastes (especially in the very early examples), using techniques such as scattering black marks to mimic bangs and gouges in the varnish or removing layers of varnish in the middle of the backs à la Vuillaume. This, and the artificial shading of the varnish, announced his departure from the pure Antoniazzi style. 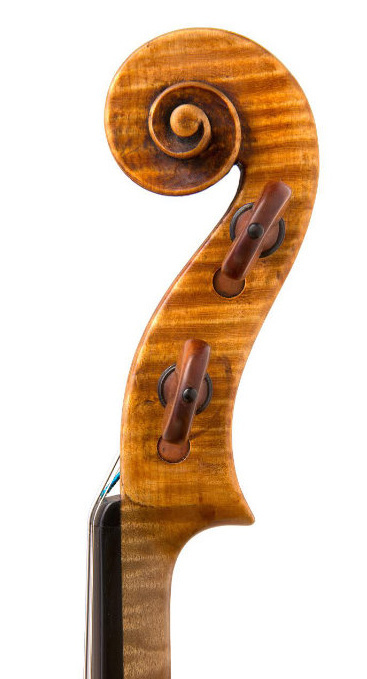 In my experience, while instruments made for him by Gaetano Antoniazzi do not have this characteristic, the ones made from 1900 onwards almost invariably do. Part 2 focuses on Bisiach’s later prolific making period.